The Jackson County Library’s Science Club created a human piano while studying conductivity using the library’s Makey Makey, an interactive circuit board device, during Science Club: Play-Doh Lab this Valentine’s Day. Along with creating a human piano, the kids made their own Play-Doh and used it to make Play-Doh portraits, as well as to play games such as Tetris and Pac Man with the Makey Makey. LIFESPAN empowers teens and adults with disabilities to live, work, and play in their communities. 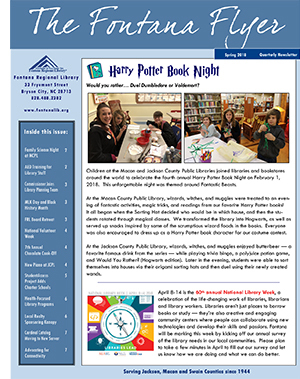 Partnerships with the local library have made that mission a true reality in Macon, Jackson, and Swain Counties. “The library has been an excellent partner to reach those who need a boost to get back into the workforce,” said Alisha Tatum Senior Director of LIFESPAN. “Our Employment Specialists assist with finding employment and training new employees to succeed at work.” Employment Specialists assist with everything from building interviewing skills, developing an effective resume, completing applications, and matching applicants to the right positions. If there are local businesses in need of qualified applicants, contact LIFESPAN’s Program Coordinator Amanda Nicholson today to discuss how she can assist you with filling open positions. Amanda can be reached at 828-201-2743 or anicholson@lifespanservices.org. February 7, 2017 - In keeping with Fontana Regional Library’s mission to provide the public of Jackson, Macon, and Swain counties with excellent service and convenient access to resources for their educational, informational, and recreational needs, the Regional Board, members of the local county boards, and library staff attended a retreat led by Molly Westmoreland from the North Carolina State Library. The meeting, held at the Balsam Mountain Preserve in Jackson County, discussed the roles and responsibilities of library board members and the challenges and benefits of regional libraries in North Carolina. Each of the FRL member libraries are now planning to actively engage with their local communities on all of their new FRL long range plan goals. Starting with the strategy Advocate for affordable “last mile” broadband connectivity for our service area, FRL IT Manager John Tyndall and the Marianna Black Librarian Jeff Delfield have recently submitted membership nominations for the Swain County Broadband Committee. More updates and stories will follow as more of FRL member libraries “connect” with their local communities. The Marianna Black Library Planning Committee is arranging for another fundraiser to help build a new library in Swain County. The Fryemont Inn, in Bryson City, will host an evening of food and a silent auction in mid-April (date and time to be announced soon). Items from area crafters and businesses and local antique collectors are being donated and they are not to be missed! The folks at the Fryemont are known for their hospitality and excellent faire — so this is sure to be a hugely successful fundraiser. Stop by the Marianna Black Library or call 828-488-3030 for updated information about this event or to purchase tickets. In other news, the planning committee has been looking at the space needs for the new library. A subcommittee has looked at every space recommendation and fine-tuned the allocated areas and their adjacent areas. This will get the group one step closer to meeting with an architect, who will develop a rendering of the new library. This rendering will be an important step in helping the public visualize the new library and the services it can provide to the entire community. Jackson County Public Library Staff and Volunteer Technology Mentors have been offering traditional computer classes at the Department on Aging (for people 50 or older) for about a year and half. The topics have ranged from Using a Smartphone to Facebook Security. Based on recommendations from Seniors and the Senior Center staff, we will now be offering short information sessions on technology during lunch. This series called “Lunch and Learn” is meant to teach Seniors about emergent technology and electronic library resources. A fundraiser for the Reading Rover Bookmobile will be held on Saturday, March 25, 2017. The event will take place at Jack the Dipper and South of Philly in Sylva. The fundraiser is a coordinated effort with WCU Center for Service Learning, Jack the Dipper, South of Philly, Fontana Regional Library, and Region A Partnership for Children. There will be fun activities for kids from noon to 2:30 p.m. The infamous ice cream eating contest will take place at 3:00 p.m. and a new eating contest added this year which involves philly steak fries at 4:30 p.m.
10% of the days sales at Jack the Dipper and South of Philly will be donated to the Reading Rover. Come on out and enjoy some food and fun to benefit the Reading Rover! The Library lost a member of our family on February 17, 2017, when Teresa Bryant, the Branch Supervisor at the Nantahala Community Library passed away. Teresa first came to work at the library on July 1, 1994. Since that time she has been the face and spirit of the Nantahala branch of the library. Teresa was known for her kindness and her gentle spirit. She always had a smile for everyone. She will be greatly missed by her family, the library staff, and by the community.